A Little Life was the first book I chose from my 2016 Reading Challenge, a book recommended by a librarian or bookseller, and what a way to start! I am normally able to get through a novel of this length in a couple of days, depending on what else is going on in my life; I began this on January 11, and didn’t finish until March 22. It isn’t a difficult novel to read in the sense that the prose is complicated or confusing; it was hard for me to get through simply because of the challenging plot. The main character, Jude, is a heartrendingly broken man, and the story of his brokenness was, at times, too much for me. A Little Life is the story of four college classmates, who move to New York to make their way: JB, an occasionally cruel painter who is trying desperately to make it in the art world; Malcolm, the genius architect; Willem, kind, handsome aspiring actor; and Jude, a brilliant litigator with a tortured past and a disabled body he refuses to acknowledge. As the years go by, each of these men achieves huge success in their fields: Willem becomes a world-famous movie star, JB’s paintings of his friends are shown in galleries all over, and Malcolm is designing buildings on every continent, while Jude is the head of his law firm. Their relationships through the years have deepened and grown, and the men themselves go through addictions, sickness, love and death. Through it all, we see Jude become continue to crack along the lines formed by a horribly traumatic childhood. He is haunted by his past, sure that if he tells the people he loves about what happened to him, they will not only judge him, but turn away or worse. His scars define him, and just when he is healing for real, the universe kicks Jude in the teeth once again. After years of friendship, Jude and Willem have fallen in love, and are happy together. Jude’s myriad health problems are finally on the mend, after some major surgery, and their life is good. For the first time in his life, Jude is happy. And then BOOM! Jude’s life is blown to smithereens once again. While this novel truly broke my heart, it’s easy to see why it was recommended by so many, and nominated for so many awards. I’d recommend it gladly, as long as you aren’t looking for something to cheer you up. Eat. Sleep. READ. That’s all. It’s a new year (well, duh! ), and I’m posting, finally. No apologies or excuses for my absence this time, just a fresh start. And a challenge. I love a good book challenge, and this year, I’m taking Anne’s from The Modern Mrs. Darcy. The 2016 Reading Challenge is relatively simple, without a huge number of books, which I need right now. And the variety is great! I honestly cannot decide on which of the books my wonderful friends Karen & Rob selected for me, so I’m adding both of them to the list! * A Little Life by Hanya Yanagihara I took this recommendation from the employees at Powell’s, where this novel was on several folks top-five books of 2015. This category is last, because I don’t have anything for it yet. Once 2016 gets going a bit more, I’ll fill this one in! As I read these (and everything else!) I’ll post thoughts, reviews, etc. I’ll begin reading these as soon as I finish what I’m currently involved in! Join me, won’t you? Let’s make 2016 a year full of books! And if anyone has suggestions for books published this year, let me know! 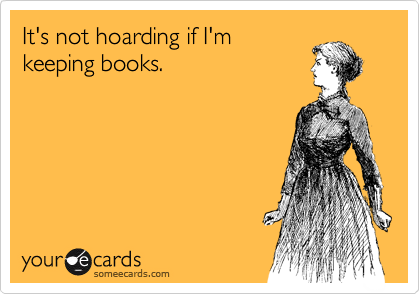 It’s Not Hoarding if They’re eBooks, Right? If Hoarders ever decides to do a show on people who have too many books, they’d over look me, because, really, my library of “real” books isn’t that big. Comparatively speaking, that is. Not nearly big enough to land me a spot on a show like that. My ebook library, on the other hand, is getting out of control. 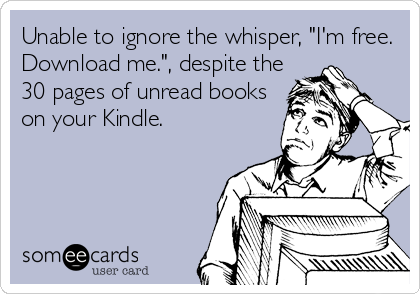 I’m fairly sure that I have at least 150 unread books on my Kindle app. Then there are the ones on Aldiko, Google Books, Moon+Reader, and OverDrive. We won’t even mention the dozens of fanfiction books/stories lurking about my tablet, or the audiobook waiting to be listened to. 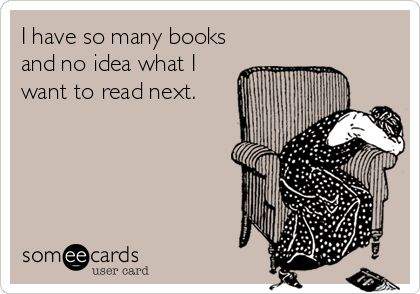 And I’m not counting the things I HAVE read. Except for those things I’ve read before in a paper version, all of these are new to me. I’m addicted to free book sites, and some days, spend more time searching out free things to download than I do reading. It’s distressing. Now, this is not to say I don’t read at all, because we all know that isn’t true. 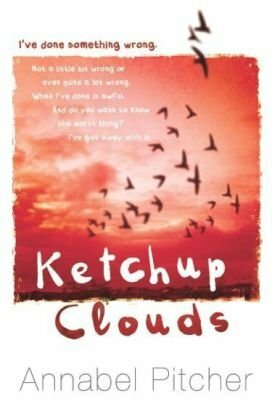 I’m halfway through an odd book called Ketchup Clouds by Annabel Pitcher. It’s a YA novel about a teen girl writing to a man on death row, and confessing all her dark secrets to him. Twisted. Just my style. I went to college. Actually, I went to several colleges, and changed my major several times before I finally finished, but that’s totally not the point. The BA I finally ended up with is in English:Creative Writing:Poetry, with a minor in Theater. Yes, that’s a degree that will get you a job in any field! Before we get to today’s poem, can someone explain to me why, when I am feeling low, watching a show like Dexter, or reading a Jonathan Kellerman novel, full of blood and mayhem, monsters and murder, makes me feel so much better? It can’t just be me, or these things wouldn’t be as popular as they are, right? I’ve spent the last two days watching Dexter on Netflix, while doing all the other things I need to do. And yes, I suddenly feel so much more normal. Really, compared to most of the characters on this show, I’m a paragon of mental health. Good to know. And now for the literary portion of today’s post! One of my favorites. Enjoy. 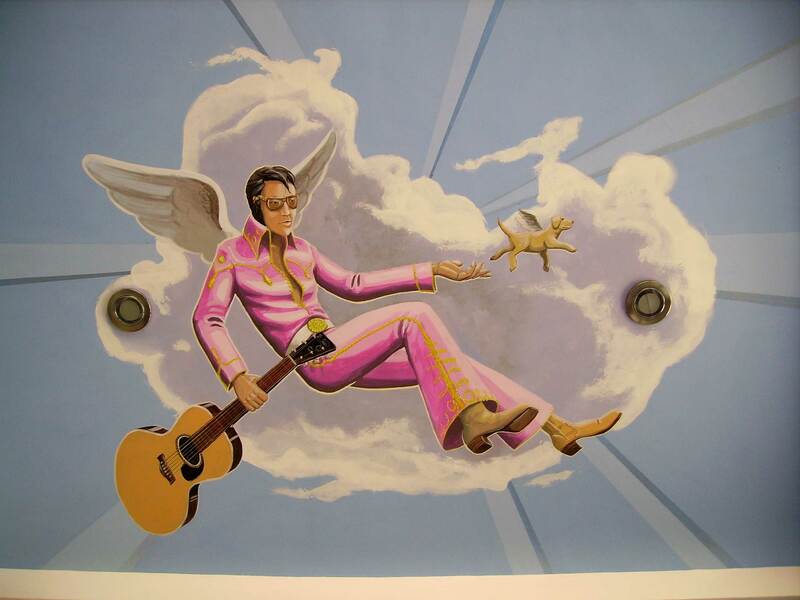 my words the songs of a generation. my name resonates on the tongues of cappuccino demigods. Fall through velvet loveclouds into beds of miracles. a literary, bad-­tempered love of scarlet phrases in my head.